The solar cooker is suitable for smoke free cooking, baking, grilling, frying and deep frying. Due to the high cooking performance of the parabolic solar cooker, meat, grill, pasta dishes, baked food stuffs ( e.g. bread, pies, pizzas), stews or boiled meals are prepared nearly as quickly as cooking them on an electrical stove or in an oven. Helps stop deforestation and associated soil erosion and prevents further depletion of the ground's nutrients. Reduces carbon emissions and global warming. Cooking with solar cooker does not generate smoke, as does traditional cooking over open fires. When preparing food indoors, the fumes can become overwhelming. Women and children inhale these fumes which lead to respiratory diseases. Smoke also irritates eyes. 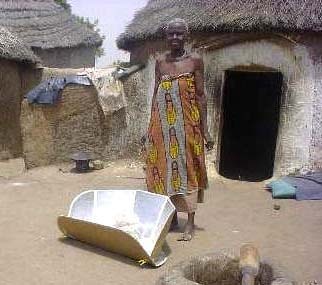 Families can use the solar cooker to boil contaminated water and improve hygiene. When using a solar cooker 50 litres of drinking water can be pasteurised every day. Burn injuries caused by open flames can be avoided and medical instruments can be sterilised. Women and children don't have to struggle for hours to gather firewood. Children can have more time to study and improve their education rather than gathering wood. Money spent on buying firewood will be saved and used for other purposes. Families can use the solar cooker in micro enterprises e.g. preparation of juices and jams, roasting peanuts and frying dough nuts, selling baking products, food preservation e.g. boiling food and using at a restaurant.